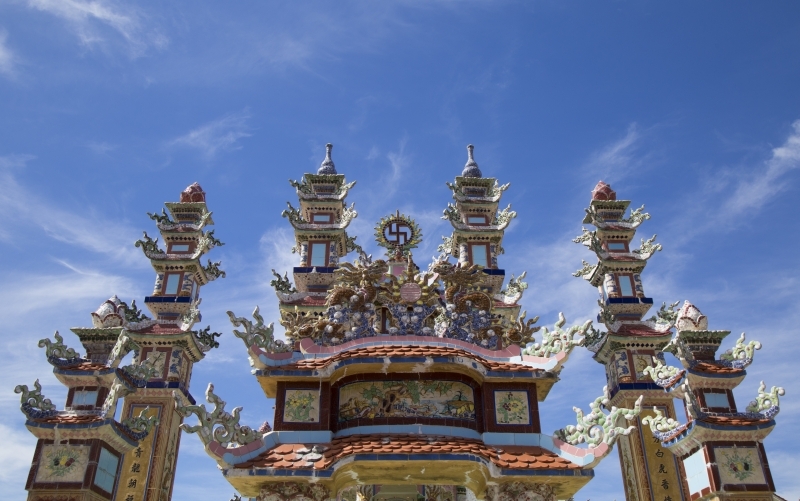 In Vietnam, belief of the afterlife and the importance of its preparation runs deep among the populace. “There’s a saying that’s really popular around here: “Life is fleeting, but death is eternal.” Everybody here knows it, and while some don’t agree with it, most do. “Death is serious business for people in Hue,” says 82-year-old Luong Do, keeper of Hue’s An Bang tomb city. 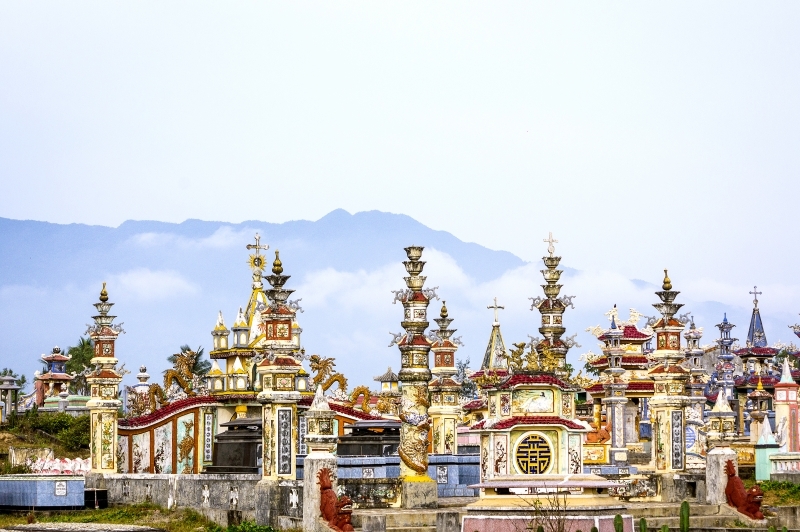 Located on the outskirts of Hue, An Bang village’s transformation from a former fishing community into the bustling city of the dead it is known as today began in the early 90s when a national economic uplift brought wealth to millions of Vietnamese. With their newfound windfall, the villagers used it plan for their afterlife or the death of their relatives. Before long, elaborate mausoleums and ornately gilded sepulchers started replacing rough-hewn tombstones and cheap markers made out of wooden sticks. Their size and beauty grew as the people accumulated more wealth. Singular tombs soon graduated into sprawling complexes of interconnected clan mausoleums. In ten years, the once unassuming An Bang graveyard ballooned from a small plot to overtake the village almost entirely. These days An Bang is known first and foremost for its thousands of tombs fit for kings and the almost single-minded dedication to the preparation of the afterlife of its residents. It has even appeared on Agence France-Presse, an international news agency headquartered in Paris, for the sheer majestic and wildly eclectic architecture of its cemetery. 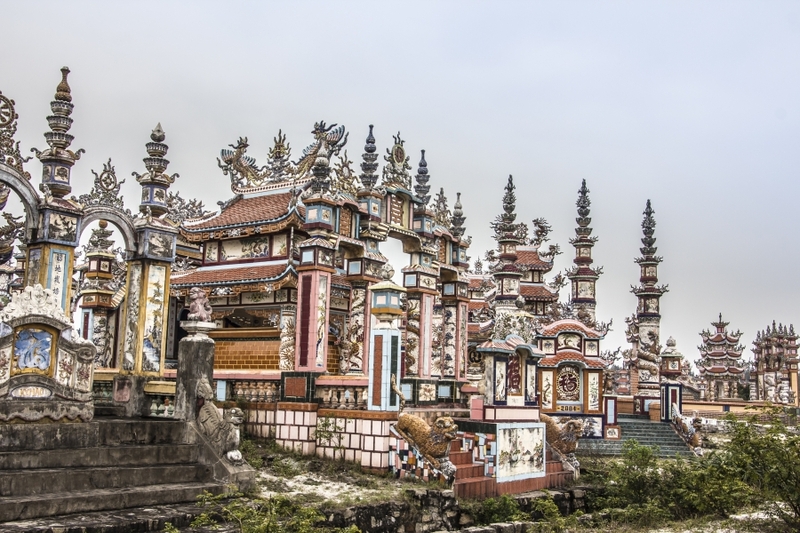 Unlike nearby Hue, where UNESCO regulations are in place to preserve the 18th and 19th century buildings, locals in An Bang have been free to let their creativity run wild. From Buddhist-style temples to Gothic tombs, with a hefty sprinkling of Romanesque columns, the cemetery’s aesthetic is anything goes. 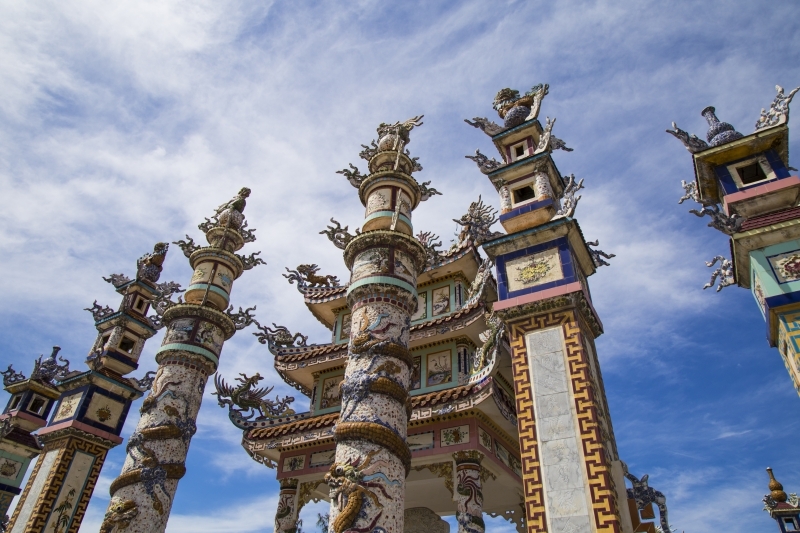 While traditional Vietnamese dragon carvings are popular, some graves also appear to draw inspiration from Hindu imagery, with others featuring Christian or Islamic symbols. A few of the tombs stand empty as some villagers have built them in advance of their own deaths, including one that was completed in 2005 and is now waiting for its owner. Because of the enormity and meticulous details on the tombstones, they require constant upkeep and this is where Luong Do, and other professional tomb keepers like him, come in. And in An Bang, even the tomb keepers are special, with some families claiming they are the descendants of the keepers of the imperial tombs. Luong Do is in the process of passing down the family business to his sons and grandsons. He says there is more that goes into the keeping of a tomb that just dusting. There are funeral rites to be observed and remembrance rituals to be carried out. And, above all, everything has to be kept in pristine condition and the cleaning must be carried out with the utmost of respect. There are even months when the keeper is required to live in the tomb itself and not with his family. This is a task that comes with a lot pressure according to Luong Do.